Over the past year SDX and our team have been involved in some very exciting productions scheduled for release this year. Although we cannot give away too many plot details we can give you a small taster of what to look out for during this years annual shark week broadcasts and more. A direct follow up to the acclaimed “Great white serial killer” production aired during shark weeks’ 2013 schedule. Return of the serial killer sees TV presenter Brandon McMillan team up with Ralph Collier of the Shark Research Committee, Edgar Becceril (one of Guadalupe’s’ leading biologists) and Jimi Partington of SDX. 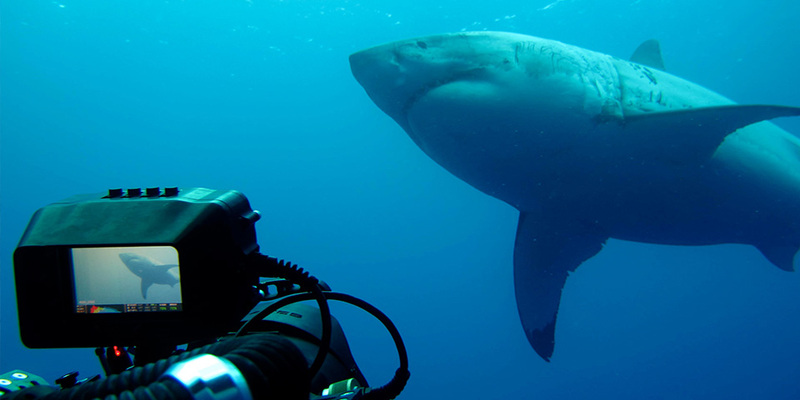 The mission – to find a link between shark attacks along the Californian coastline and the Guadalupe Island shark population. During the shoot last year, our team helped film some very exciting segments and uncovered some fascinating mysteries. Another Discovery channel production filmed with us during 2014, due to be aired this year is the follow up to “Lair of the Mega shark.” Producer Jeff Kurr and Cameraman Andy Casagrande team up once again this time with Dickie Chivell of Shark Cage Diving in South Africa to search for and film some of the largest great white sharks on the planet today. With the aid of our team and multiple gadgets and experiments we managed to film some enormous sharks on this production including many of our regular sharks seen at the island come late November. Jimi of SDX is currently down working in Cape Town with legendary shark photographer and expert Chris Fallows of Apex Shark Expeditions and “Air Jaws” fame. We have heard through the grapevine that future discovery shoots are due down there this year. On top of this our regular Guadalupe Island team are in talks with further film shoots come late November…. watch this space and we will keep you posted. Keep in touch with our updates and we will be releasing further details on the above and future productions as the year goes on. In the meantime, keep watching shark week and following Shark Diving Xperts.